Resale prices of non-landed private homes in August rose 0.7 per cent month-on-month and 3.2 per cent from a year ago. They are now off just 4.3 per cent from their last peak in January 2014. Month-on-month, resale prices in the core central region and outlying areas increased by 0.2 per cent and 1.6 per cent respectively, while prices in the city fringe stayed the same, the estimates showed. August's month-on-month price rise was a turnaround from the 0.3 per cent decline in July, which was revised up from a 0.5 per cent fall. 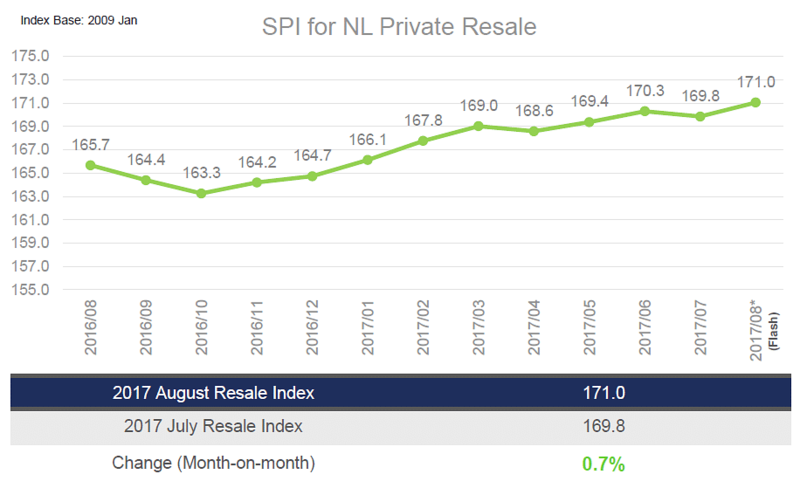 Before July, resale prices had risen month-on-month since November last year, with just one dip in April. Year-to-date, prices have increased by 3 per cent. In another indicator of a recovery in the private resale market, the number of non-landed homes sold rose 19.2 per cent to 1,273 units compared to the 1,068 units shifted in July. Compared with a year ago, sales were up by 50.8 per cent compared to 844 units resold in August 2016. It was also the best monthly sales for the last two years. Resale volume though was still 37.9 per cent lower than its peak of 2,050 units in April 2010. SRX's median transaction over X-value (TOX) - which measures if buyers are overpaying or underpaying its computer-generated market value - was zero in August, unchanged from July. For districts with more than 10 resale transactions in August, District 1 (Boat Quay/Raffles Place/Marina) and District 3 (Alexandra/Commonwealth) posted the highest median TOX of S$20,000. Among relatively active districts, District 20 (Ang Mo Kio/Bishan/Thomson) posted a TOX of -S$20,000.